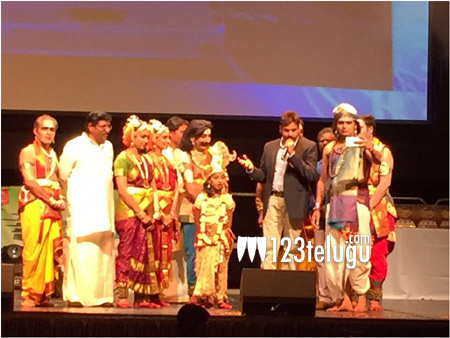 UK Telugu Association (UKTA) held its 6th Annual day celebrations and closing ceremony of “Jayate Kuchipudi” and “Jayate Bathukamma”, a UK/Europe cultural extravaganza on July 9th 2016 at Troxy, London, where more than 1500 attendees participated. The purpose of the cultural festival is to awaken and spread the spirit of Telugu Art forms in UK and Europe. This has created a high momentum and energy among the UKTA members and Telugu diaspora living in UK and Europe. The guests started coming in much early from 03:30 PM onwards and started exchanging well wishes. The program started on-time at 05:00 PM. The hall was decorated so elegantly and the reception team made the event look so traditional amidst traditional telugu background score, mixed with drum beats and folk beats has charged the enthusiasm among the guests and an impression that this is going to be a great farewell to the traditional art form torch bearers. At the start of the program a special mention on people who made invaluable contributions not only to the Telugu traditional art forms but to the society as a whole and thanked them who held the spirits of Art forms high. As per Telugu culture, the program started with a candle lighting ceremony with an elegant group of dignitaries present on the stage. The dignitaries included representatives from all the European Telugu associations and sponsors. There was a big applause from the audience to mark the great start of the occasion by the local artists being part of this opulence and “Jayate Kuchipudi” welcome song by a group of children. The program continued with live concert, followed by Dasavataram, Mahishasuramardhini sthotram, Yakshagaanam, ancient telugu art form which includes Bhama Kalaapam, Gayatri Vanamaali and Bhakta Prahlada by Kuchipudi Natyaramam artists. This Yakshagaanam is the first of its kind performed out of India and performed by the original kuchipudi family, continuing this as a family legacy. After these riveting performances, the performing artists and the European Telugu associations were presented with mementos by Pawan Kalyan, Chief guest of the occasion. Speaking on this occasion, he expressed that he would like to be a brand ambassador of Telugu art and culture and take this to the wider reach of the world. He then explained that arts are a part of the culture and why all should contribute, embrace and encourage them. He stressed on the need for encouraging the artists is indirectly saving these traditional art forms and taking it to the next generation and all the NRI’s should make it as a habit. This was followed by Folk performance by Vaddepalli Srinivas, who was representing the folk culture of Telangana State, entertained the crowd after chief guest’s message. Speaking on this occasion, Mr Vaddepalli mentioned that performing folk arts are of three types, folk music, folk dance and folk drama; where in music and lyric are the main content. Very few of them like Naagini dance, Tiger dance etc., are devoid of lyrics. There are nearly 200 such folk art forms noticed in Andhra Pradesh and Telangana. The main purpose of these art forms is entertainment. Satya Prasad Killi, Chairman UKTA got a standing ovation from the audience when Prasad Mantrala declared that UKTA would do everything possible to strengthen UKTA and take the service motto to the wider Telugu community under Shri Killi’s guidance and mentorship. Other notable attendees including UKTA Trustees, Media personnel, sponsors from different parts of the UK and Europe graced the occasion. Finally, Prasad Mantrala, Business Chair-person extended a vote of thanks on behalf of the UKTA Team. He thanked all the volunteers who have helped plan the kickoff and specially thanked the host of the event Smt. Kalyani gedela, teams responsible for managing the invitations, technical arrangements, stage setting and lighting, musicians, catering, press and media. Due thanks were also conveyed to the leaders from other prominent Telugu Associations in and across UK/Europe. He also stated that the entire team has worked hard under the mentorship of UKTA Chairman, Shri. Sayta Prasad Killi, who had tirelessly coordinated with Telangana and Andhra Governments in identification of artists and Government of India for supporting the cultural cause, to make “Jayate Kuchipudi and Jayate Bathukamma” a grand success. He also provided insight on how UKTA was formed 6 years ago and how the organization has carried out numerous activities including but not limited to the areas of social, wellbeing, awareness, sports, sponsorship and education. The UKTA committee present conference team briefed the audience on the roadmap for the coming years and explained about the activities for the future. The UKTA Annual day celebrations in traditional style saluting the art forms has become the town and the entire Telugu community is looking forward to participate in further UKTA events.